I crossed America on the train – Amtrak’s ‘Californian Zephyr’ west-to-east service: San Francisco, Sacramento, Reno, Salt Lake City, Denver, Omaha, Chicago. A journey which – if you don’t stop – takes 5 days. I was breaking my journey up and wanted a stop somewhere between San Francisco and Denver where I’d be getting off next for a few days. A day’s travel from San Francisco (and half an inch on my USA map) is Reno. ‘The biggest little city in the world’ as the sign says. Reno is primarily a gambling town, a smaller version of its much bigger sister Las Vegas 400 miles south in Nevada – casinos, neon and fast marriage parlours. Not the sort of place I would naturally be drawn to but I wanted a taste of a little bit of everything of America, and surely this is one face of the American dream? So that grey afternoon after my first day’s train journey I pulled my suitcase the few blocks from Reno station to the Eldorado Hotel – and ‘omigod’-ed giddily at the scene – casinos, towering hotels and pawn shops, currently in daylight. Is there anything more ‘morning after’ than switched-off neon? 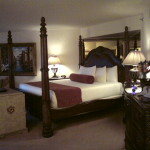 I found the Eldorado through Tripadvisor, recommended for all the right reasons. It was also close to the train station which meant I could walk, which I’d learnt was a good way of doing this – walking from my point of arrival to my next place meant I didn’t have the expense or hassle of working out the next leg of a journey, plus I’d actually ‘be there’ immediately. 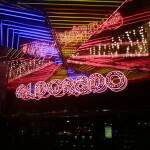 The Eldorado was also one of those casino hotels which again would not normally be an attraction, but for the purposes of this quick point-and-stare visit made it ideal and all in all most convenient. But then I got there. I’d seen it from the train – in disbelief – a towering huge place, its name emblazoned on the side that you can spot a mile off, let alone walking down the street. I don’t stay in places like this. Tripadvisor somehow hadn’t prepared me for this. 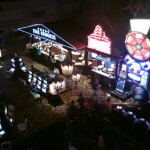 I walked in, and there it was – the ground floor an expanse of games machines going off endlessly into the distance and tables and tables of people hunched around playing dice, and is it blackjack? – the whirly-round thing with numbers in black and red? The real thing that I’ve only ever seen in the movies. I found my way to the escalators at the centre which went to hotel reception. The walls on either side of the escalators were emblazoned with photos of some of the lucky souls who’d won jackpots on various games/machines over the years. (I wondered, could that be me..?) Hotel reception was as flash as the exterior, and I began to think I had outclassed myself, still in for a penny! The man on the desk upgraded my room for no apparent reason and I went up to see what I’d got. Again – omigod! – a massive room with almost a 4-poster bed, a Jacuzzi tub, floor to ceiling windows and luxurious proportions all round. Is this a place where real people actually stay? Yes, but not normally me. From budget accommodation in Bucharest… I wished I’d had someone to share the out-of-this-world novelty factor of it, but for the same reason it wasn’t somewhere I naturally felt at home. My now well-travelled bag felt even scruffier, my trainers even dustier. Still, I am who I am, and made it my own by going through my usual ‘arrive-somewhere’ routines – washing out some smalls and draping them where I could, in this case over the arms of a fancy table lamp. I could quite happily have lived out some kind of ‘dream’ staying in the room all evening – having a bath in the silly bath, ordering room service (I don’t think I’ve ever ordered room service) and watching the telly (a huge screen that came up remotely in front of the enormous bed) – pretending I was in some kind of movie that this felt like the set for. But that would have to wait till later. I wouldn’t have ‘done’ Reno if I hadn’t gone and explored, especially now it was dark and the neon was on. So I went for what was actually a very short wander down the main street. 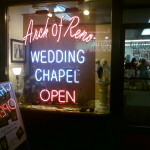 I discovered Reno really is actually quite little (especially in these recession-hit times with some casinos closed) and it only took me 10 mins to wander about, survey the casinos, marriage parlours and pawn shops all now at their neon-lit best. 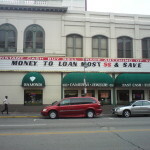 Yes, even the pawn shops in neon – conveniently located cheek-by-jowl next to the casinos, so you don’t lose a moment to dash out to pawn your wedding ring or give them your car keys – and dash back in to carry on the game. Wow. Places like this really do exist. I’d got a taste and that was enough, already the giddiness of it all beginning to wear off. At the door to the Eldorado were a couple of homeless men who I’d passed on my way in that afternoon too. They seemed to permanently hang out there, fascinated but stunned, as if this glittering place was where their lives were ruined and if they could just go inside one more time they might find their former selves and lives again. Inside I wandered around and there were miles of it – the Eldorado is part of a huge complex – casinos, hotels, a theatre, bars and restaurants – a world that seems to go on forever, that you never need to leave if your money doesn’t run out. 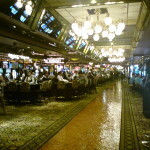 Room after room of slot machines, tables, and side rooms for the heavier looking poker games. People buying $100’s worth of chips or shovelling notes into the machines. Women of all ages in a uniform of high heels and mini-skirts bringing the gamblers their drinks; people from every nation of the world employed running the tables. Fountains with horses, gods and cherubs that people had actually thrown money into – Reno’s olde lucky plastic fountain? Here I was, what a strange world. But while here I thought I better had have some go at some sort of bet (when in Rome – maybe I could get my photo on the Eldorado wall of fame at the escalators?) But I didn’t know where to start, so I went to the information desk. ‘Bless your heart,’ the woman said, as if she had never come across a genuine innocent in this place before, and sadly regretted that she was about to lead me to corruption. She handed me a complimentary tin of Eldorado mints confusedly as if to make up for it. She called a colleague over and the nice man showed me a machine that you put a dollar into and make bets of 20 cents. Doesn’t look like I could ruin myself on that. So what am I doing here..? Hit the button and get the same things to line up. Am I wrong but there doesn’t appear to be any skill in this? Surely it’s just a random thing of the machine, that – dare I say it – could be fixed to never make 5 of the same thing, especially the high-scoring things –line up? Anyway I put $2 into it and definitely won something, but as I couldn’t get it to cough up my winnings I just carried on pressing the button till it was all gone. I was exhausted after such highs and lows and quit while I could. It was time to eat. Reno is a place people go to for a wild night or weekend, on the train I had heard a couple of women on their way for that very purpose. They had mentioned ‘the buffet’ which I clocked is bit of an American institution. Having a hearty appetite myself, and wanting to participate in all the quintessential American experiences, I made my way over. And there it was – America in mountainous heaps of food – pasta, sauces, pizzas, steak, fish, seafood, salads, potatoes, pork chops, Chinese dishes. As much coke as you could drink, and puddings – apple pie, chocolate brownies, carrot cake, cheesecake, fruit tarts, and about 14 flavours of ice-cream. Wow! In my childlike and hungry state, I was excited, whilst simultaneously realising what an excess it all was. I managed to avoid doing what just about everyone else did – piling a bit of everything onto a plate creating a mountain, and leaving most of it – what a waste! Most people – even Americans – or any other kind of westerner come to that – can’t eat more than one plate of food, so the myth of ‘all you can eat’ is really only a bargain if you are fuelling up for some major athletic event which not many of us have the excuse for. Despite the temptation I had a little tiny bit of half the things I liked, a little bit of 3 kinds pudding, added the Eldorado house cocktail, was stuffed and managed to leave it at that. Back in my room I had a bath but the jacuzzi feature scared me, and I didn’t have the confidence to call for help with it. The movies on the tv were another $12 each, bugger that. So I went to bed, bloated and clean, but I didn’t have a great night’s sleep in the lap of luxury. For many people I guess a night – or a lifestyle – lived in rooms like this is the epitome of success, something to aspire for – certainly not least to the people, rich and poor – gambling downstairs. 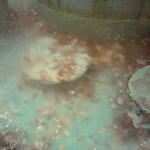 But to me, after my initial laugh over it, ultimately it just felt weird, unreal and cold. I couldn’t delude myself for more than the initial moment of ‘omigod’. It was like something from a movie, but movies set in places like this don’t always turn out that well do they? In the night I had a sense that this room, for all its flash, had witnessed some dark moments. The next day however I made the most of the room’s excellent wi-fi to Skype my partner, and then having nothing else to do in this temple to mammon, checked out. But what to do in Reno with 3 hours to kill before the train? 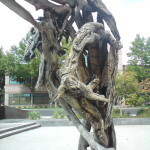 I had found out that Reno had an art gallery, the Nevada Museum of Art so I headed there. 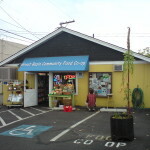 But she also told me about the food co-op where I could buy some fruit for my journey. An organic food co-op in Reno? Well, well. 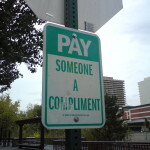 On my way to the station I noticed other things about Reno I hadn’t seen before – quirky public art, a shared earth café, a couple of alternative type young people hanging around, a tongue-in-cheek notice mocking America’s tendency to put bossy notices up demanding obedience all over the place. I got the impression Reno harbours a punk anti-establishment scene. What a relief to discover Reno had another side! And a lesson to me, reducing America – or one part of it – to a stereotype. If you have enjoyed this and would like to see ‘Beyond Dreams of Aberystwyth’ go further please click on this link to see what you can do to help make that happen! You can also submit comments below. Thanks for reading.